We transfer, copy and convert wedding video tapes to DVD and Editable Digital File Formats. If a family member was kind enough to video the wedding, then the video may include the following formats. All the above video formats were popular in their day, and, apart from MiniDV, are now completely obsolete. Under typical storage conditions, analogue wedding video tapes will have a life of around 20 years, after which, significant image degradation will become apparent. In damp or humid conditions, degradation and damage can occur within 5 years. The obvious message here is don't delay! Get your camcorder tapes to us as soon as possible and ensure that your invaluable wedding memories are not lost forever. It is not uncommon for VHS, Betamax and camcorder wedding tapes to snap or get chewed up while playing them back. If you have a broken and damaged wedding video tape, we may be able to fix it for you. We can resplice snapped chewed up and mangled video tape as well as well as repairing broken cassette housing. As part of the process the contents of the tape are transferred to DVD. We can convert any PAL (UK Standard) camcorder tape to NTSC TV Standards (for USA, Japan etc). If you wedding video was shot in America, Canada, Japan or the Middle East it will in NTSC format and will need to be converted to play on UK PAL TV systems. We can transfer NTSC MiniDV or VHS tape to PAL. For other NTSC to PAL conversion services please call for availability. Wedding video computer editable digital files in DV AVI, .Mov, Quick Time and MP4 are available. Some of our customers require editable files from their wedding videos for editing on a PC or MAC. We normally supply uncompressed AVI files which can play on both systems. 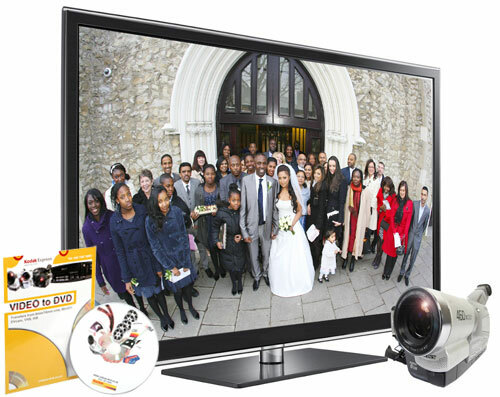 Transferring your wedding video to DVD or digital files for editing costs £20 per tape. You can choose to have the video footage encoded to DVD so that it will play on you TV system and home computer. Alternatively, you can have the video footage as a digital AVI file for home computer editing. “What a fine job you did in transferring our wedding video to DVD. We watched the DVD over and over again and posted copies to our family in UK, Ireland, and throughout the United States. You will be highly recommended to all we know"